Airplane recycling pertains to the process of harvesting parts and materials from end-of-life aircraft. As the airline industry looks to become more eco-friendly as well as to cut costs, one area of increasing interest is that of aircraft recycling. With 12,000 aircraft scheduled to be decommissioned over the next two decades, recycling will play a larger role. Aircraft recyclers remove various components and materials including short and long glass and carbon fiber composites, aluminum, wires, textiles and carpet, landing gears, electronic devices, foam, fluids, titanium and steel alloys, engines, and other components. The most valuable components are typically the engines and parts which can be reused or refurbished. These high-value parts provide for the profitability of recycling operations, especially if the plane has detailed maintenance records about the history of those parts. The recovery of other materials from the carcass or shell of the aircraft is less profitable than the retrieval of parts. While still a young industry, aircraft recycling is becoming a more urgent priority as more and more airplanes land for a final time. The airplane recycling process begins with non-destructive dismantling activity. First, some easily removable items such as passenger seats, engines, and other components are taken—eventually, just the shell remains. At that point, a massive excavator demolishes the vast shell of the airplane. Once different parts of the shell are broken down into small pieces, they are transported for the next phase of the recycling. There are various types of metals to recycle, as well as plastics, so a sorting process is required. A powerful magnet is used to separate iron and steel from aluminum and plastics. A final manual check ensures error-free sorting of all the materials. Once everything is separated, each of these materials is diverted to separate recycling streams. Eventually, these recycled metals may be introduced as raw material to produce a range of items. Once recovered and processed, reusable materials of old aircraft are used to produce such products as circuit boards, computers, and TVs. Some airplane parts can be recovered or refurbished for reuse in new aircraft. 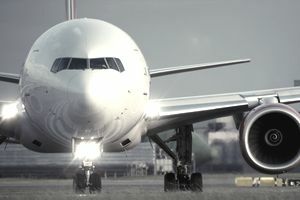 Utilizing old aircraft parts such as galley carts, trays, and overhead bins in the fitting of new planes can help aircraft producers control costs. In fact, aircraft are increasingly being retired earlier in life to harvest parts, which can generate more revenue than being sold intact. Increasingly, airplanes are being designed with reuse and recycling in mind. Recycling reduces landfill requirements, consumption of natural resources, and energy demand. Environmentally friendly disposal of airplane waste reduces air, water, and soil contamination. The Aircraft Fleet Recycling Association (AFRA) is recognized as the leading global trade association devoted to promoting and pursuing environmentally best practice in the recycling and salvaging of aircraft parts and materials. It was established in 2006 to ensure a sustainable management of end-of-life aircraft engines and airframes. It is the sole non-profit trade association whose member companies center on the end-of-life commercial airplane processing. AFRA collects, unites, publishes and promotes the collective experience of all of its members as the Best Management Practice. AFRA ensures a greater collaboration and communication among all its member companies. Until today, its member companies have contributed to 2000 airplane being returned to the market. AFRA estimates that over the next 20 years, 12,000 airplanes which worth $1.3 trillion will be at the end of service life. Currently, 80-85 percent of an aircraft is recycled which was less than 50 percent only a few years ago. AFRA aims at increasing this number to 90 percent by the end of 2016.